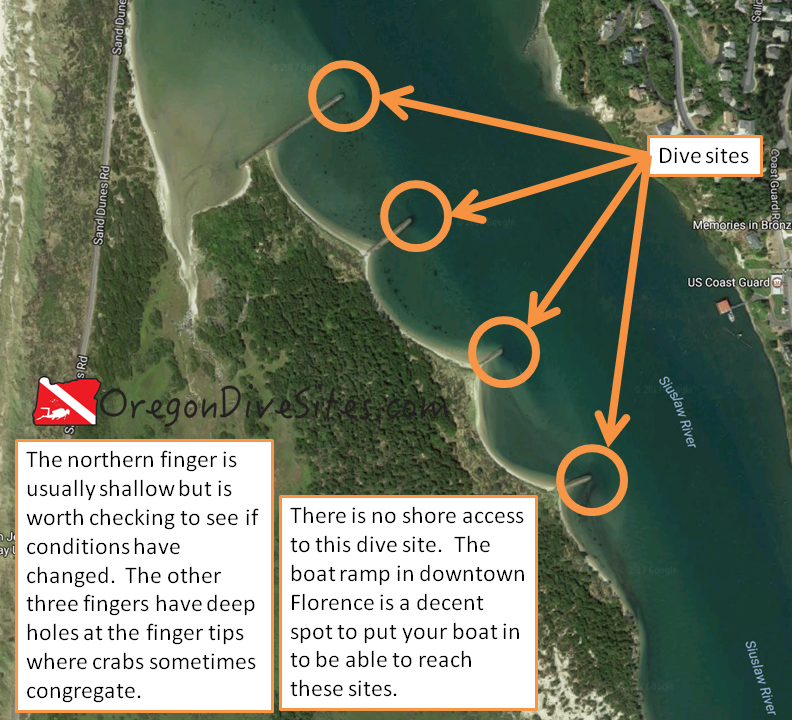 The south jetty inner fingers at Florence are seldom visited by SCUBA divers but may be worth the effort if you are looking to do something a little different on the mouth of the Siuslaw River. This salt water dive site is really four sites that are next to one another. At the tips of the jetty fingers, currents dig holes in the sand where crabs often congregate. This isn’t an amazing series of dives but they are interesting dives. If you have a boat and want to check it out, put your boat in upriver and come down to the inner fingers. The two highlights of this site are 1) the relative inaccessibility of the dive site compared to other sites around Florence and 2) crabs. As far as jetty dives go, the dive sites along the north jetty in Florence have more micro life and often have more fish. However, because so few people visit the inner fingers along the south jetty, crabs can sometimes be found here in abundance. At the least, it’s worth a look if you’re bored with the other sites around Florence or if your attempt at going offshore to one of the reefs is canceled due to rough seas. Florence, Oregon is just on the other side of the Siuslaw River. You’ll need a boat to access this site. There are put-ins further up the Siuslaw River. Pick your favorite boat launch and motor down river until you come alongside the US Coast Guard pier and boat house. The four inner fingers are on the other bank of the Siuslaw. The boat launches all have decent parking for your truck and boat trailer. Unless you fancy a long surface hike from one of the county beach access parking lots across sand and brush, there is no shore access. The inner fingers on the south jetty of the Siuslaw River have some interesting holes in the sand where crabs sometimes congregate. The four fingers are spread out roughly north to south with the northern-most finger usually having the shallowest hole. The other three fingers usually have deeper holes but it is very dependent on the season and how the river has been flowing. If the US Army Corps of Engineers has recently done dredging in the Siuslaw River Channel, conditions will be unpredictable but the holes might get deeper and better for catching crabs. The fingers themselves are generally pretty shallow heading to the west. You can check out along the base of the fingers but there isn’t much reason to go beyond the holes at the finger tips. This is pretty much strictly a boat dive. Plan accordingly. This is a boat dive unless you love a very long hike across soft sand in SCUBA gear. There is usually current due to the tidal exchange and river conditions. In the excavated out holes at the end of the fingers, water can swirl around and make a diver confused. Good compass skills are a must so you don’t end up going the wrong way. Generally there aren’t waves unless a ship is passing. We have never seen surge or surf here but that doesn’t mean it can’t happen. Vis at the inner fingers on the south jetty usually is around 10-15 feet. Sometimes it gets a little better and sometimes it’s much worse. We suggest only diving these sites at high tide so you have the best chance of good viz. Being so far up into Siuslaw Bay, water temperature is largely driven by river conditions. If a big slug of cold water from snow melt in the coast range is making its way down the river, you might see temps in the 40s. Otherwise usually you’ll see the low to mid 50s at this site. This site can be dived at any time of year. Do it during crabbing season if you want to catch crabs. It’s hard to say what depth you are going to find at the inner finger tips. It’s not unheard of to find 25 feet of water in the holes. However, you might only find 10 feet of water at high tide if sand from a recent storm has filled the holes in. If you have a depth sounder on your boat, you can drive over the area to locate the deepest place to jump in at. Advanced open water training is a good idea here. You also should be skilled at boat diving and be prepared in case you get separated from your boat. This is an intermediate skill dive because of diving from a boat. No walk is needed unless you’re braving the loooooong hike from a parking area. No surface swim is needed unless you anchor your boat far away from the holes at the jetty tips or if you get separated from your boat. You’ll have more fun if you dive this site at high tide. At low tide, there is very little water around the fingers. It’s a good idea to run a dive flag here because of boat traffic. Gone are the days of easy air fills on the central Oregon coast. The shop in Florence is long gone. The shop in Newport moved. The air fill station in Depoe Bay is by appointment only. Same goes for the one in Port Orford. You’ll need to head over the coast mountains to Eugene for the closest local dive shop with air fills and full service. The old town waterfront in Florence has lots of good restaurants. Head there and pick one that looks tasty! There are a plethora of campgrounds that the county, state, and feds run around Florence. We’ve stayed at a few and had pleasant experiences. We haven’t tried any of the hotels so please let us know if you find a hotel that is SCUBA diver friendly!